Did you know this drink actually helps to fight the flu? It's true. 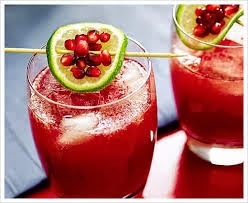 Pomegranates have a unique antioxidant called punicalagin that stops replication of the flu virus! Even better - this is a great recipe to use for guests this Christmas that tastes absolutely yummy. Combine the whiskey, green chartreuse, vermouth and pomegranate juice in a cocktail shaker. Add sugar and shake well. Strain into a glass filled with ice. Garnish with sage, if desired, or lime. You'll be the star at your party!